Hi guys, this lake is such a amazing ecosystem! The fishing has been very good for walleyes the last few weeks. I’ve been targeting walleyes in the 8′-15′ of water. Mornings and evenings have been best which is typical for walleyes anywhere. I did find a area that had some dirtier water and we were able to catch them throughout the day. The best baits have been rattle spoons tipped with minnow heads. Along with jigging raps and the rattle jigging rap bait called a Phantom Tilly. Ed’s Bait and Woodland Resort both have what you should need to get started if you don’t have these already. I haven’t noticed a color preference really. But my guys have been using gold/black, chartreuse and perch colored spoons, and jigging baits. 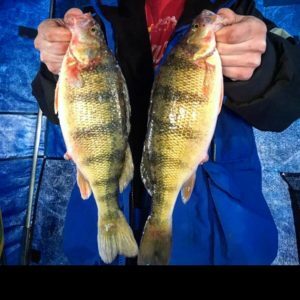 Take a look at your map and find a good walleye looking spot and there will be fish there. Don’t be afraid to try a ripping rap style baits either. Some days those have been lights out. The perch fishing has been hit or miss. Lots of lookers for everyone you connect on. Some days we’ve had 5 perch and others we’ve had 30 Plus. All you can do is make the most of your opportunities when presented. Spikes on tungsten jigs in 35+ feet of water have been my most consistent producer. Spoons loaded up with spikes are also a good bet day in and day out. Look for transition areas to deeper water with a feeding “shelf” ideally. Active feeding perch will use these to chase down their meals. Don’t forget they are forever roaming and most days you’re chasing them. Please pick up your garbage, the last couple weeks it seems that I see more and more of it every day. If you pack it in please pack it out. Last but not least, take a kid fishing!! Take a bunch of kids fishing. Now is the time of year to get them out chasing flags!! Have fun and be safe.